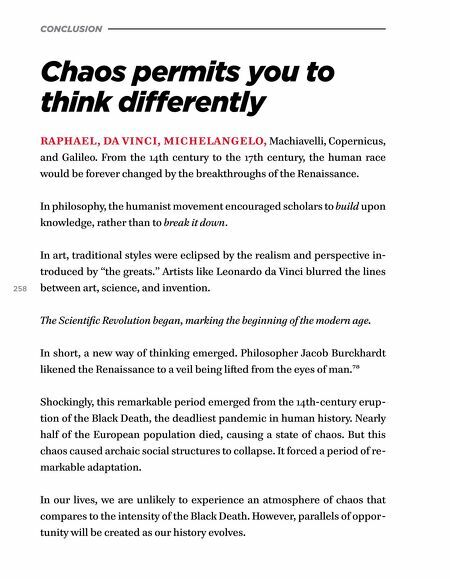 CONCLUSION Chaos permits you to think differently RAPHAEL, DA VINCI, MICHELANGELO, Machiavelli, Copernicus, and Galileo. From the 14th century to the 17th century, the human race would be forever changed by the breakthroughs of the Renaissance. In philosophy, the humanist movement encouraged scholars to build upon knowledge, rather than to break it down. 258 In art, traditional styles were eclipsed by the realism and perspective in- troduced by "the greats." Artists like Leonardo da Vinci blurred the lines between art, science, and invention. The Scientific Revolution began, marking the beginning of the modern age. In short, a new way of thinking emerged. Philosopher Jacob Burckhardt likened the Renaissance to a veil being liſted from the eyes of man.78 Shockingly, this remarkable period emerged from the 14th-century erup- tion of the Black Death, the deadliest pandemic in human history. Nearly half of the European population died, causing a state of chaos. But this chaos caused archaic social structures to collapse. It forced a period of re- markable adaptation. In our lives, we are unlikely to experience an atmosphere of chaos that compares to the intensity of the Black Death. 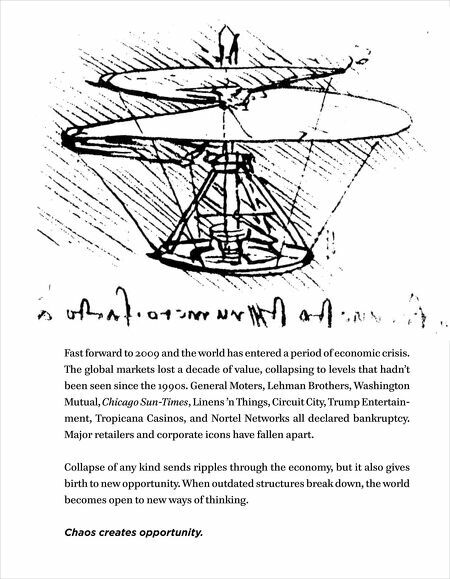 However, parallels of oppor- tunity will be created as our history evolves.